WATT-MAN LED Lighting is the most trusted name in LED lighting. 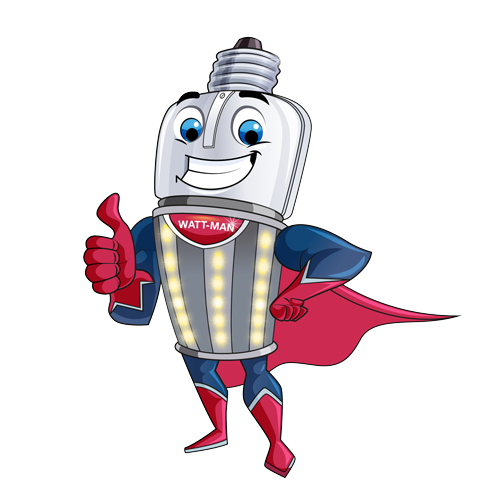 Count on WATT-MAN to provide energy-efficient, long-life, low-maintenance LED lighting solutions. Commercial LED solutions are backed by accessible, toll-free technical experts. Your trusted resource for retrofitting exit signs, high-bay and low-bay lighting, perimeter lighting fixtures, recessed can lamps, and hundreds of more energy saving LED retrofit applications. Enjoy the benefits of LED lighting, and learn more about LED technology from WATT-MAN. WATT-MAN LED Lighting offers a comprehensive selection of high-quality LED retrofit lamps and lighting fixtures for industrial, commercial, and specialty applications across every industry. From hospitals and nursing homes to shopping malls, banks, casinos, hotels, retailers, manufacturers, and more, count on WATT-MAN to deliver quality LED retrofit alternatives for incandescent, fluorescent and miniature lamp light sources. Call toll-free (1-800-296-3948) to speak with a USA-based LED lighting consultant or communicate via fax or email. WATT-MAN LED technical experts will ensure you get the right LED retrofit solution. We’ve been earning our customer’s trust for more than 30 years. WATT-MAN has carried the concept of providing quality LED lighting products, outstanding service, and expert technical support into the twenty-first century. That’s why we’re the most trusted name in LED lighting.